This article explains the process of Splicing. So far we have discussed the different parts that make a standard FOBOT. The FOBOT itself, the through adaptors and the pigtails. 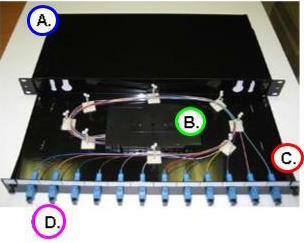 To terminate the fibre, the fibre cores must be joined to the pigtails which then connect to the back of the through adaptors or fibre adaptor panel. 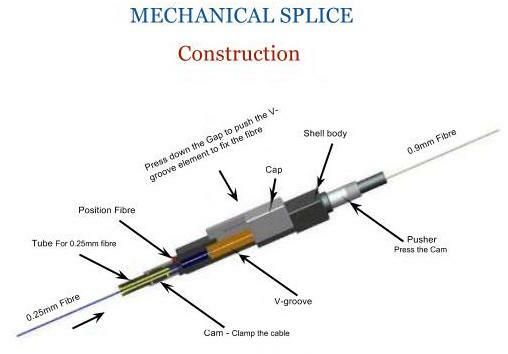 One thing we have mentioned a number of times without explanation is this joining of the fibre cores, known as "splicing". As you could imagine, joining two pieces of fibreglass 9uM in diameter is no easy task. There are two main methods of doing this - read on to find out more! Fusion splicers come in many shapes and sizes, but in the end all achieve the same outcome. Mechanical splicing is still used today but quite often is avoided because it is almost an art form. Margin for error is quite low, the process is quite fiddly, and a large number of steps need to be taken to achieve a quality join - quite often making it not worth the time when compared to fusion splicing. Mechanical splicing uses a small, mechanical splice (about 6cm long) to permanently join the fibres. The small fibre connector aligns the two bare fibres and secures them mechanically. For an indication, mechanical splicing usually has an insertion loss of up to 5 times more than fusion splicing. Even if you know what you are doing with this stuff, 1 or 2 will fail out of every 10 due to the process.